Michigan United Conservation Clubs (MUCC) provides this update on the “Feral Swine” saga here in Michigan. This, after the March 2014 ruling by the Marquette Circuit Court which overturned the Michigan Department of Natural Resources’ Invasive Species Order (ISO) which declared wild hogs to be an invasive species. Photo courtesy of http://www.mlive.com. 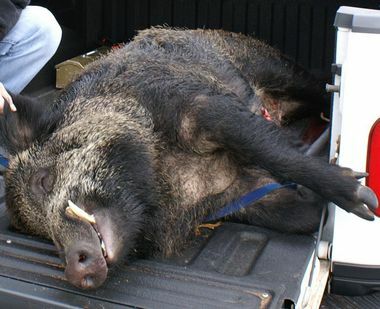 A 350-pound wild boar shot in Mecosta County. Who knew? Who knew that a face only a mother could love would have so many high-powered friends? At a time when most of us can’t seem to get the necessary laws in place to stop automated phone calls from coming into our home at dinner time, it seems that Michigan’s remaining owners of wild hogs have found a sympathetic ear in the state legislature. It may be recalled that this authority to enforce the ISO was granted through the passage of House Bill 4579 in 2009. This was the legislative response to the myriad of risks associated with released animals and the nearly 20 facilities whose feral swine had tested positive for the pseudorabies virus thereby threatening Michigan’s pork producers. Michigan wildlife managers were hoping that proactive intervention might avoid the pitfalls of inaction observed in other states which ultimately led to free-ranging populations of feral swine. (B) Domestic animal means those animals which live under the husbandry of humans. (H) “Native Swine” means swine born and raised in this state or legally imported to this state. Although not a joking matter, perhaps the authors of the legislation envision a process whereby a Russian Boar born here in Michigan then becomes a Grand Traverse Boar, or an Otsego Boar. Sorry, but genetics don’t work that way. A potentially harmful exotic or invasive species is just that and attaching the word “domestic” does not put lipstick on this proverbial pig. Just ask the Connecticut woman who no longer has her original face because of the 2009 “domestic” chimpanzee attack. This initiative also largely ignores the fact that the only facility operators eligible for what is essentially an animal amnesty program are those who have remained in possession of these animals in spite of the law. Conversely, passage of this legislation would also, in effect, punish those operators who elected to comply with the law and disposed of their inventory in advance of the deadline. All of this once again speaks to the bigger question and that is this: why is it so difficult for legislators on both sides of the political aisle to accept the concept of Scientific Wildlife Management? If we get a diagnosis from our family physician that we don’t like we certainly wouldn’t dream of going to the state legislature to have it reversed. Matters involving science-based fish and wildlife management should not be any different.